If you like reading books about the Holocaust, Corrie ten Boom’s tale of her family’s role in the Dutch Resistance should definitely be added to your reading list. The Hiding Place is one of my favorites. I liked that Corrie began her story years before Germany occupied Holland. It drove home the fact that things changed gradually, and without warning. The book captured the growing fear among everyone, and the subtle changes in lifestyle that finally resulted in the realization that this was war and nothing would ever be the same again. If you’re not familiar with the ten Booms story, they were Dutch Christians living in Haarlem, Holland. A Jewish family came to them seeking refuge and they took them in. At the time, everyone received ration cards for food and Corrie bravely asked a family friend who worked in the ration card office for 100 cards. He gave them to her, and the ten Booms began taking in more and more Jewish refugees. 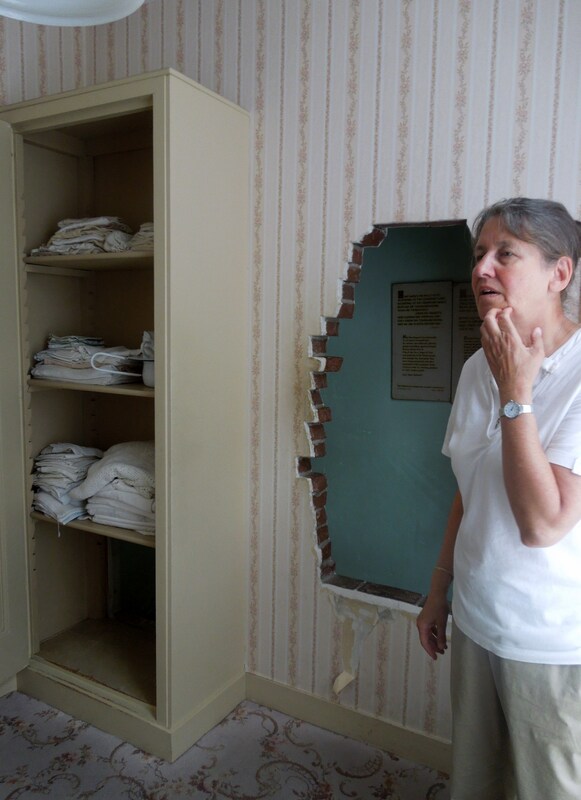 The family built a secret hiding place (a beje) behind a wall that measured roughly 30″ deep. On February 28, 1944, Nazis raided the ten Boom house and searched for the Jews they were sure the ten Booms hid there. At the time, 6 people were hidden in the cramped hiding place and remained there for 47 hours. I won’t give away any more of the story. Read it for yourselves. I will say that I found the smaller details about day-to-day life fascinating: the radio broadcasts, riding bikes without tires, ration cards and curfews. Hiding the Jews and the amount of clever planning it took: removing all traces that other people had just been dining, or had left trash, or belongings behind. The minute details that had to be attended to were incredible. As were the codes they used on the illicit telephone, the messages passed through the underground and the signal in the window. Even more incredible to me was that an entire community kept this secret. I was amazed that all of the ten Booms’ neighbors knew what was going on at the Beje and yet no one turned them in. Is it any wonder that I had to see this place for myself? 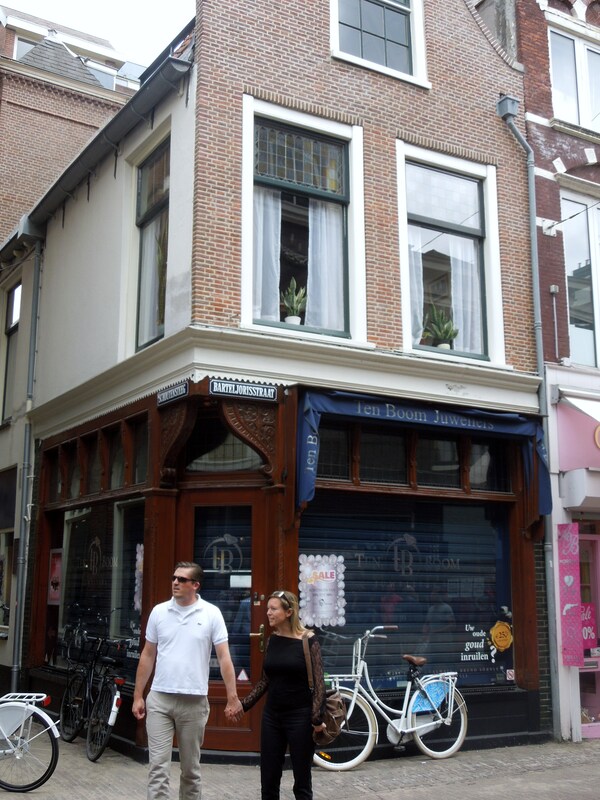 The Corrie ten Boom House is now a museum in Haarlem. 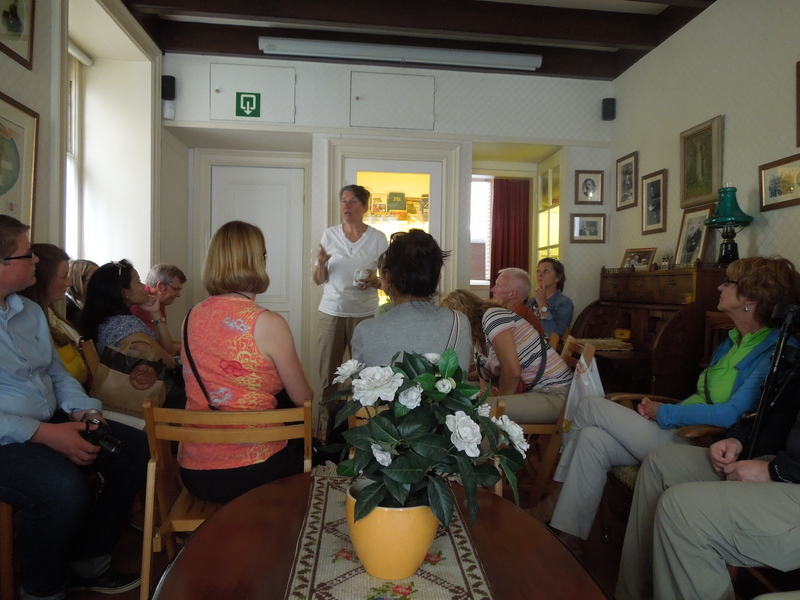 They offer free guided tours to a limited number of visitors a few times a day. I got there just as the last tour of the day was about to begin and joined the 30 or so people standing in line in the alley. Though our group was very large, the tour guide mercifully let us all in. I was relieved since I was only going to be in Haarlem for the day. She gathered us in the ten Booms’ living room and told us about the family in what turned out to be a much more Christian-based lecture than I’d expected. But I wasn’t there for a sermon. I wanted to see the hiding place. I imagine, so do you. 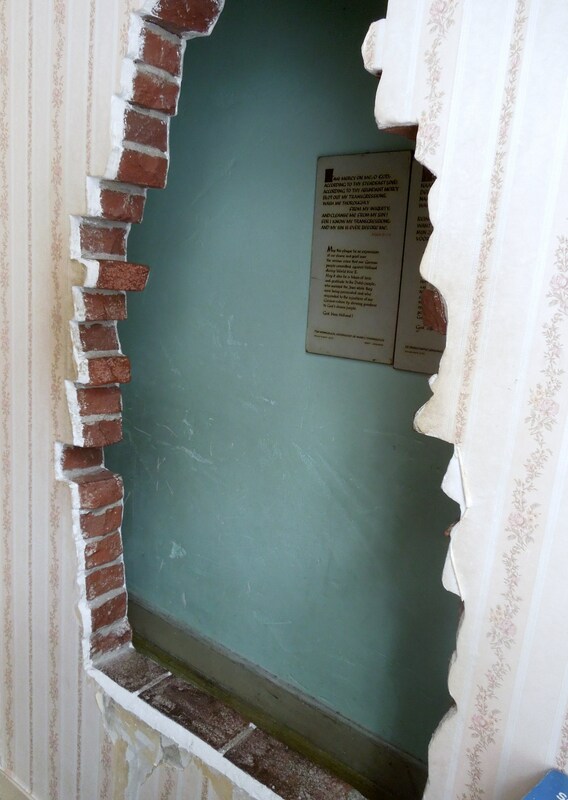 This is the hole that’s been busted through the wall so that we can peer into the small hiding place. You can see that it’s not very deep. 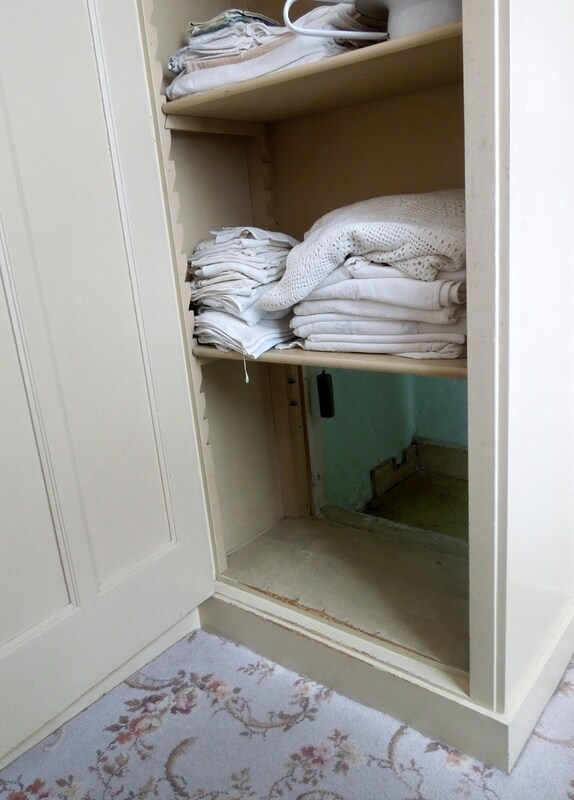 And this is the linen closet with a sliding door in the bottom shelf. This is what the refugees crawled through to get to the hiding place behind the wall. I think this picture shows some perspective about how small the bedroom and hiding place were. When I read The Hiding Place, I felt like I was a better person for the experience of it. Visiting the ten Boom house in person made me feel the same way. I stared out their windows at the bustling street below and the houses surrounding and tried to imagine what courage it must have taken to stand up against the German Occupation. I could picture the story so clearly. I’m dying to tell you how the story turned out. But I won’t. Read the book, or better yet — read it and visit the museum. Are you familiar with the ten Booms’ story? Thanks so much for sharing – I will check this out. I’ve read the book. It was an awesome story and Corrie Ten Boom was my heroine. You’re so lucky to have seen the place for real. Thanks for sharing your experience! I hope you have the chance sometime. I’m glad they’d preserved it and want people to come and see it. Sounds an incredible story. For sure that family would have ‘disappeared’ had they been found out, or informed upon. Of course we know a little about the German persecution of the Jews here in Jersey C.I. One woman, Louisa Gould, died in Ravensbruck for sheltering a Russian slave worker. She was the victim of an informant neighbour (who we think is still alive, in a care home). Louisa’s story sounds more similar to the ten Booms’ than you may realize. In fact, I wonder whether they met??? I read the book years ago but it has stayed with me. An amazing example of what “true” Christianity is. The story has always stuck with me, too. So inspiring. There was definitely an insidious onset – and yet it’s tempting for books and movies to jump right in. Harder to captivate an audience with a slow start, I guess. That was one of the things that was so interesting to me when I took a class on the Holocaust during college. We saw all these American newspaper stories that touched on what was happening, but they were buried in the paper and seemed like a small story. Books that let us see how gradual and unreal so much of it seemed are the most impactful to me. It always makes me wonder what I would have done and if I could have survived it at all. How wonderful that you visited this museum. I am familiar with Corrie’s story since I saw her film at church when I was a child. Of course, it always stuck with me. I have not seen the film. I keep forgetting that there is one. Thanks for this reminder. I’m going to track down a copy. Somehow this WWII junkie has never heard of the Booms’ story! I added the book to my Goodreads list. I think I’ve taken enough of a WWII break after researching two books now. I can go back into the era without it feeling too close to work. That hiding place is crazy small!